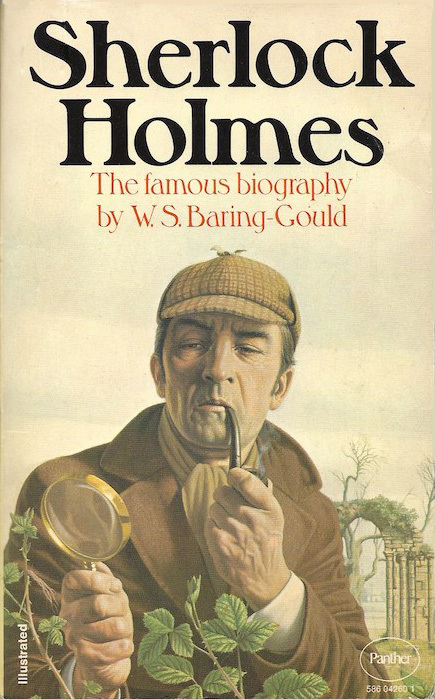 First published in 1962, this is the 1975 UK Panther paperback edition of William S. Baring-Gould's fictional biography of Sherlock Holmes with magnificent cover art by Richard Clifton-Dey. In the U.S. the book was released as Sherlock Holmes of Baker Street. Sherlock Holmes has become a legend, his very name synonymous with brilliant crime detection. Here is the first comprehensive biography of the man, written with scrupulous accuracy, thoroughness and a warm, infectious enthusiasm. Tracing Holmes's career, W.S. Baring-Gould has revealed many hitherto unknown facts: his parentage and early life, his somewhat erratic years at Oxford, Cambridge ad Bart's, as well as an interlude on the stage on Britain and America. Holmes little-known relationships with other celebrities of the time – including King Edward VII, Karl Marx, Lewis Carroll and Bernard Shaw – are put in the perspective of his mysterious 'missing years.' For those long acquainted with Holmes's superb feats of detection and newcomers to the classic accounts of his exploits alike, Sherlock Holmes provides fascinating and unputdownable reading.